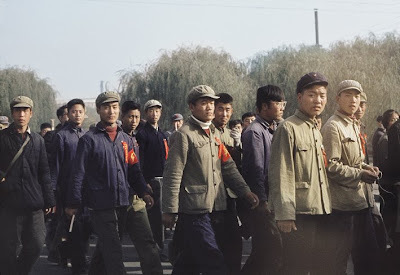 A friend of the blog forwarded to us information about a current exhibition in Shanghai, "Beijing Sixty Six," which features startling photographs of the Cultural Revolution by Solange Brand. The curator of the show, Jean Loh of Galerie Beaugeste, kindly agreed to write a piece for us about reactions to the exhibit, as well as allowing us to share a few of these recently-uncovered photographs. You can learn more about the exhibit at Facebook, City Weekend, or about Galerie Beaugeste (located on Taikang lu) at its website. 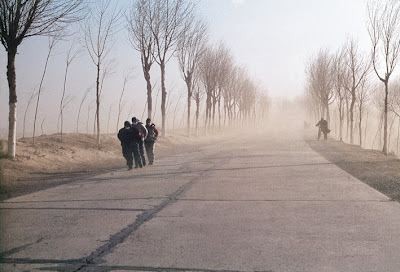 In 2002, the cofounder of the Pingyao International Photography Festival, Alain Jullien, invited an unknown amateur photographer to participate in the annual visual feast that went on to become the landmark of Chinese photography today. Solange Brand, then the Art Director of the newspaper Le Monde Diplomatique, mentioned in passing to Alain that she had been in China from 1966 to 1968, and had not set foot on the Mainland since. 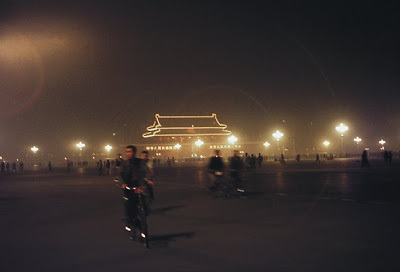 When Alain asked if she had taken any pictures of China; that innocent question turned out to be a major discovery: Her Agfa color slides and prints buried in a shoe box for all those years emerged to become an award-winning book. That same year in Pingyao I was privileged to be in Solange's hotel room where she first showed her sensational pictures on my laptop screen. Everyone in the room was awestruck. And I was captivated by the freshness of the images as if they were snapshots made just the day before. Later during the al fresco projection, many of the Chinese photographers were moved; all were fascinated by this very rare natural portrait of “Beijing '66,” and in color! The projection was accompanied by revolutionary songs Solange has collected during her stay and a tape she made from the demonstration at the gate of the French Embassy. The commotion amongst the Chinese photographers was incredible: after the show some of them marched on the main street of Pingyao singing aloud the Red Sun Rising on the East and other vintage revolutionary hymns before settling down for baijiu and huangjiu at the main tavern where Marc Riboud’s pictures were hanging on the wall. Far from the Beatles in Beijing 1966 there was another King of Pop, another Idol who had millions of teenagers rocking and rolling. Solange Brand was 19 or 20 years old, the same age as these young Red Guards, when she was sent to work as a secretary at the French Embassy in Beijing. 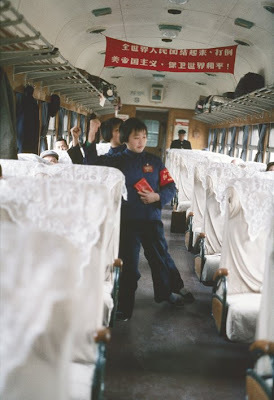 Unknowingly, with her Pentax she captured the beginning of the Great Cultural Revolution. 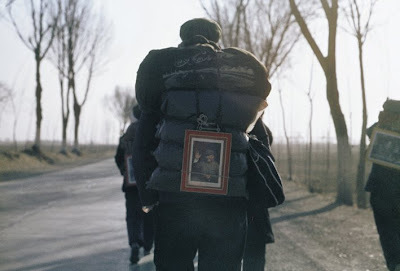 What, with indescribable emotion, the Chinese photographers in Pingyao saw was perhaps a “self-projection” or “self-identification” with the faces of these young men and women, even children, who could have been themselves from a long lost memory. Here lies the power of photography: What the Chinese viewers experience is like taking a swab of reality—an operation of “cut and paste”—and transposing it to fill in the void in our imaginations, to fill in the empty place in our collective memory, to fill in the absence as in our absentmindedness. We are confronted again by Roland Barthes’ famous “Ça a été—that has been.” Photography's immediacy acts to set up an instantaneous observation of the experience of its author. As a result of the cut and paste, this transposition becomes an affirmation of “I have seen this” or “I have been there.” Hence the excitement we feel in the possibility of scrutinizing each face in the crowd and asking of ourselves: Was that how we looked at that time? With incredible conviction the Chinese public of a certain age - those who were at least 6 years old in 1966, and who have never set foot in a gallery or a museum – came to our exhibition in Shanghai and proclaimed in front of the enlarged print: “I was there! Exactly at this spot!” One former Red Guard asked me to specifically take a picture of him standing by the enlarged print as if to finally own a picture certifying he had been there. They all told the same story: it was the most exciting years of their youth; UNFORGETTABLE - that was the word they keep mumbling. 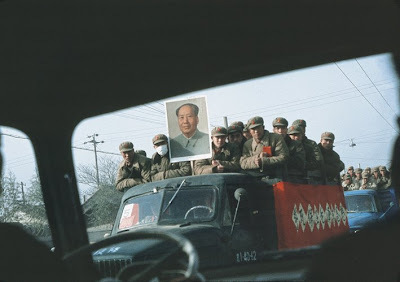 With agitation they pointed to the Mao pin and said everyone had at least a few pins, later on even giant size pins, that some of the most fanatic pinned directly on their flesh. In 1966, the Central Committee of the Cultural Revolution expressed support for students throughout the country to come to Beijing to exchange revolutionary experiences, and also supported the Beijing students to carry out the revolution throughout the Great Rally. On September 5, 1966 "The Notice" was published, and the Great Rally activities developed rapidly. Between June and July around the country the "Rally" between teachers and students was formed. Many of those coming from the provinces came to Beijing to receive the "Bible of Cultural Revolution Rebellion" and to take part in Chairman Mao’s reception for teachers and students. Those who left Beijing were to carry out the revolution and to fan the flames around the country for the “Destroy the Four Olds” movement. 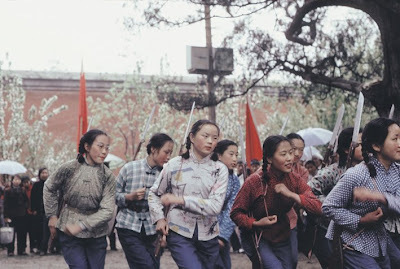 There were mainly teachers and students, the Red Guards, "the External Red Circle" and ordinary high school students, but some were also primary school students accompanying their brothers and sisters. Chairman Mao Zedong received the Red Guards on eight occasions in 1966: August 18, August 31, September 15, October 1, October 18, November 3, November 10, November 26. From all over the country, young people and students of more than 13 million people came to salute Mao. Teachers and students of the Great Rally traveled by all means of transport; accommodation and meals were all free of charge. That was a very special moment of the "Cultural Revolution." Diane Arbus had the conviction that there are things people would never have noticed had she not photographed them. Thanks to Solange Brand we relish the opportunity to take in every detail of the clothing, of every particle in the air, of every expression on the faces in this "Beijing Sixty-Six," and ask ourselves: Where have all these heroic faces gone? The students with their uniforms; those “lake hero” figures (Jianghu Renwu) with their fur coats of another age; those dancers on the train expressing their revolutionary fervor with a martial choreography; and those pilgrims on the road beaten by sandstorms but bravely carrying the icon of the holy idol on their backpacks. Where have all these Red soldiers gone? Exhibition of Solange Brand’s Beijing Sixty Six through May 22 in Shanghai Taikang Road Lane 210 Building 5 Space 519 Beaugeste Photo Gallery (Tel: +86-21-6466-9012). Fantastic pictures. I can't stop looking at them. Nice reference to Barthes also. A photograph is never of what is, but of what has been. "where have they all gone"? they were sent to the communes after their usefulness in destroying Mao's "enemies" was done. Color photographs from the period are rare indeed. This is an interesting find (the classical forgotten shoe box scenario). 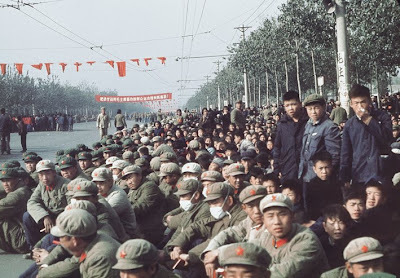 For those interested, there is an on-line archive of about 200 propaganda photographs of the Cultural Revolution at http://hahn.zenfolio.com/f320124069. about what mr boinky said: it is obvious that your comment cames from someone that never experience the joy of being a part of a revolution for the people. See their comments: "the best part of my life". What it is a real education? Going to Wall Street and steal all peoples world money ?